The Temp Sensor is a very sleepy device. It will wake up to make a measurement and only transmit the measurement if the temperature or humidity has changed significantly from the last measurement. Once an hour, it will check in with the system on battery life and wireless signal range. Otherwise, the sensor is asleep. 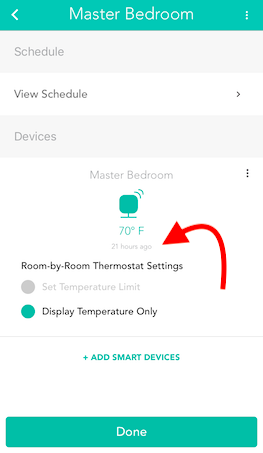 You can wake up your temp sensor early by pressing the "Wake Up" button once. Once awake, the sensor will check to see if you have asked it to blink its LED in the app, and may report its temperature. The wake up button is useful if you want to check that a sensor is working or just show it off to your friends. The humidity readings are not currently reported in the app, but will be added in time. If you recently got your sensor and find it hasn't reported in more than an hour, it's likely having trouble connecting to your bridge. Try moving it closer to the bridge and tapping its button once to wake it up. The Sensor takes a standard CR2032 coin cell battery. To open the battery cover, you can use a quarter in the slot to twist counter-clockwise. I find that it is often easier to simply use my palm to push and turn. The failsafe method is to use the adhesive on the back to stick the sensor to a surface, then twist it to remove the cover. Batteries face + side up.